It is God’s favour upon us that He has enabled us to accept the Promised Messiah (on whom be peace) who, among other things, taught us ways and means of spiritual advancement, drew our attention towards discharging rights of God and rights of mankind, inculcated in us the spirit of sacrificing life, wealth, time and children and told his Jama’at to mould themselves completely according to the teachings of God. This has been stated in the aforementioned Quranic verse. In it God draws our attention to one of our responsibilities as regards spiritual development, i.e. financial giving. Financial giving is a great source of discharging rights of mankind and rights of God. The essence of the aforementioned extract of the Promised Messiah (on whom be peace) is that financial giving is required to discharge rights of mankind as well as for publication of faith. We Ahmadis are fortunate to partake in the accomplishment of the task which was started by the Promised Messiah (on whom be peace). While the world is lost in love of money, owing to the education and training of the Promised Messiah (on whom be peace) majority of Ahmadis spend out of their precious wealth to publicise faith. It causes them anxiety if for some reason they are not able to spend as they would like to and some of them are reduced to tears in this regard. This condition of hearts is a proof that God sent the Promised Messiah (on whom be peace) in this age for the publication and dissemination of the faith brought by the Holy Prophet (peace and blessings of Allah be on him) and now progress of Islam is destined take place through the Promised Messiah (on whom be peace). And this is why God has instilled the spirit of jihad of financial giving in true believers. Below are some accounts of how in this day and age God continues to inspire hearts towards financial sacrifice. And this is not limited to any specific strata of people or any specific country. In fact this spirit is found wherever there are people associated with the Promised Messiah (on whom be peace), be it Africa, Europe or Oceania! Ameer Sahib of Burkina Faso writes that a local Sadr Jama’at says that at time of Eid ul Adha this year he did not have enough funds to cook food at home let alone have money for the required animal sacrifice. He listened to a discourse on financial giving with reference to Tehrik e Jadid following which he gave 2000 for blessing and hoped that God would meet his needs. A miracle took place and his younger brother unexpectedly sent a large sum of money from Ivory Coast as a result of which he was able to offer sacrifice of an animal and his household needs were also met. Murrabi Sahib from Burkina Faso writes that a Khadim bought cottonseed but could not find any buyers for the crop. He felt deeply apprehensive. He spoke to the Murrabi Sahib who advised him that spending in the way of God alleviates difficulty, so he paid chanda and increased his promise of Tehrik e Jadid and said that if God blessed him he would pay additional 10,000. No sooner had he received his receipt for his chanda payment that he found so many buyers for his crop that it was sold out in a few days. His income exceeded expectations and he paid a large sum in chanda in addition to what he had promised. A friend from Burkina Faso took bai’at last year and came to know that Hazrat Khalifatul Masih had made special appeal to involve new Ahmadis in one or the other financial schemes to instil the practice of giving so that every Ahmadi participates in giving. This caught his attention. The custom among farming Ahmadis in those areas is to give in the form of grain. And for this purpose they ask the Jama’at to provide them with sacks which can be filled with grain. Jama’at gave the new Ahmadi two sacks for this purpose. He felt since he was a new Ahmadi he had never given chanda before and now that he had heard that Hazrat Khalifatul Masih had urged that everyone should participate he gave grain worth 22,000. The following year his crop yield was doubled and he asked for sacks to fill grain of twice the amount! Ameer Sahib of Liberia writes that a Murrabi Sahib went on tour of villages. He sent a message to one of the smaller Jama’ats that he would arrive at Maghrib time. The Jama’at he went to before this Jama’at was large and very active therefore he spent more time there than anticipated. He thought the first Jama’at would be weak in terms of giving and arrived there at time of Isha Prayers. He said it was for the first time he saw that 170 people sat waiting for him since Hazrat Khalifatul Masih had appealed for everyone to participate in financial giving. Such is the spirit of people of the Jama’at about whom it is assumed that they may be weak in giving. If they are informed and explained in the correct manner, they are prepared to give. The weakness does not lie in their giving; it lies in the administrative system. Ameer Sahib of Liberia writes that a new Jama’at in a village which is only accessible through a very rough pathway were told about Tehrik e Jadid scheme and were then informed that a repeat visit would be made the following week to collect contributions. Such was their zeal that they said do not take the trouble to make another journey through the arduous path next week, we have understood the message, take our contributions now. Thus God is inspiring hearts of people in far flung areas who are still new to Ahmadiyyat. Ameer Sahib of Benin writes that an Ahmadi from Benin gave £1000. Murrabi Sahib said to him that other schemes also needed contributions why was he giving such a large sum to one scheme but the Ahmadi did not change his contribution. The Murrabi Sahib was correct to inform him, because the real objective is to instil a spirit of giving and not to merely collect money. Recently as usual Khatm e Nabwat Conference was held in Rabwah where fiery speeches were made by Maulawis alleging that Jama’at receives funding from big powers etc. But they also let it slip that Jama’at is progressing so much because even its poor make financial sacrifices. Neither are we in need of any governmental aid nor do we ask for it, we are simply blessed owing to the sincerity of the members of the Jama’at. Missionary Sahib from Benin writes that new Ahmadis were informed of the background of Tehrik e Jadid in a meeting and they made contributions at the end of the meeting. One of them was very impoverished and said he did not have any cash but wished to give. He went home and brought two hen’s eggs to give. This was a big sacrifice according to his situation. These accounts of far flung areas evoke memories of the time of Hazrat Musleh Maud (may Allah be pleased with him) when impoverished women would bring hen’s eggs to give as contributions. A long-term Ahmadi in Mali stopped paying chanda for some reason and also stopped coming to Jama’at programmes. He returned after a long period and paid chanda. He said he had seen a dream that he is drowning in very deep waters and there is no one to save him. He sees a boat with the Promised Messiah (on whom be peace) in it who extends his hand and saves the Ahmadi and says to him never again to be negligent about paying chanda. This is indeed a sign of the truthfulness of the Promised Messiah (on whom be peace) that he guides an Ahmadi from a far-flung place back to right path through dream. A dai’llillah (summoner to Allah) from Benin says that he went to collect Fitrana from a household and was told by the head of the house that he only had a limited amount of money which was required for the imminent birth of his child which would cost more than he had. He said his landlord had come to collect the rent recently and had left displeased at not being paid. The finance secretary counselled him that God blesses and helps if money is given in the way of God when in dire straits. (Although they should not have asked this person for contribution, and should have in fact helped him). The person gave and also paid Tehrik e Jadid contribution. Three days later he was delighted to tell them that after they had left with his chanda a man came with a large sum which was owed to him by someone for a long time and which he had no hope of being paid. He was able to pay his rent and was also blessed with a child. An Ahmadi from Tanzania who accepted Ahmadiyyat in 1990s made great progress and is now a Moosi. He pays chanda more than he pledges and says that ever since he has started making financial sacrifices in this way he has experienced great bounties of God. For example, he had just one house but now owns three and his children go to the best schools. A missionary from one of the regions writes that a seven year old girl who pays chanda every month brought tomatoes, peppers and oranges to give for Tehrik e Jadid. A Sadr Jama’at from Nigeria writes that he faced financial problems for some time which caused him anxiety. He realised that he had not paid chanda for three months and perhaps this was the reason he was facing financial problems. He paid chanda. The same month he was able to sell a plot of land at a very profitable price. He says that he was convinced that indeed God’s promise is truthful that He returns manifold. Later, he purchased a large plot of land for the Jama’at to build a mission house and mosque. An Ahmadi from Tanzania writes that he is educated to high school standard and was unemployed for a long period. When he found employment in a gas company as a security guard he promised right then that he would pay chanda at the prescribed rate and then fulfilled his pledge. Due to the financial sacrifices made by him he is now employed at a very high position in the same gas company and is a high earner. There is great blessing in paying chanda at the prescribed rate. A Tehrik e Jadid inspector from India writes that an Ahmadi who made great contributions to Tehrik e Jadid suffered business loss and was worried for many months. He used to phone and request for prayers that he is able to pay his chanda and also wrote to Hazrat Khalifatul Masih in this regard. He once rang and spoke of his worry; the inspector told him to pray and go to sleep. A short while later he rang and said he was coming over. When he came he had a large sum of money in his hand and said that while he was praying a big businessman who had owed him money sent him a message to come and collect his money. He had intention to pay his chanda and thus God facilitated him to have the money to do so. Naib Wakeelul Maal, Qadian writes that a sincere Ahmadi pledged 2.5 times more for Tehrik e Jadid than his previous contribution. Soon afterwards he rang to say that he had just heard of further profit in his business and felt it was due to the blessing of Tehrik e Jadid and asked to double his pledge which he had made 2.5 times more than his previous pledge. Murrabi Sahib of Kerala, India writes that last year a sincere Ahmadi had paid Tehrik e Jadid twice as much as his previous contribution and has increased his contribution on an extraordinary level this year as well. He says he started a small business a few years ago with limited resources but now has eight factories in India, Dubai and Indonesia employing more than five hundred workers. He maintains that this progress is only due to paying chanda at the prescribed rate and says that whenever he pays chanda, God grants him much more by the same evening. Naib Wakeelul Maal, Rabwah writes that once on a tour of Karachi a Khadim from Clifton asked him to increase his pledge as he seemed fit but he replied that he did not know what his individual situation and it was best if the Khadim gave a higher pledge himself. He related an incident to him that once a Wakeelul Maal went on a tour of Sind and a person asked him to increase his pledge as he seemed fit but Wakeelul Maal Sahib replied that the person should make the pledge according to his situation asking what if he quoted the sum of Rupee 5 lakh (500,000) would he pay 5 Lakh! Hearing this, the Khadim said that since he had cited this example and had mentioned the sum of Rupee 5 lakh he was going to pay this amount. Later, he also paid 1 lakh on behalf of his unborn child. Ameer Sahib Lahore writes that a lady gave her earrings as contribution to Tehrik e Jadid. Due to financial constraints she had sold all her jewellery. These earrings were gifted to her by her sister who had asked her to promise not to sell them to meet any domestic needs. The lady said she had not given the earrings to meet her personal needs but had given them in the way of God and God fulfils all needs. May God accept her sacrifice and bless her finances. Management should be thoughtful about such people and should not force people to pay. Sometimes finance secretaries and those of Tehrik e Jadid pursue people. Contributions should be taken in accordance with people’s situations. National secretary Tehrik e Jadid Germany writes that an Ahmadi made a special pledge and with the grace of God his income increased and he could pay off his debt and was also enabled to purchase a new home which had earlier seemed impossible. He says he has been living in Germany for 35 years but has never earned so much. His income increased by €40,000 in two and a half months. A new Ahmadi from Switzerland who took Bai’at last year paid 1000 for Tehrik e Jadid as soon as he entered the Jama’at and also pledged the same amount for the next year. Later when he was given more information he doubled his pledge and also pledged 2000 for Waqfe Jadid. He says following this his company nominated him for a much sought-after and expensive course which is only offered to experienced people over the age of 35. Although he is only 33 years old and had never even thought about the course the company offered it to him. He says this is only a blessing of God for the financial sacrifice he had made. Thus God assures those who believe in Him here in Europe of His existence. Another Swiss Ahmadi writes that the owner of the company he works at is very miserly and finds it very difficult to pay anyone. He pays low salaries and either ignores demands for increase in pay or finds excuses to deflect them. Once he called the Ahmadi to his office and said that he wanted to give him a raise. The Ahmadi told him of his surprise given the owner’s harsh stance in this matter. The owner said he did not know why he strongly felt that the Ahmadi was due for a raise. This happened without any outward reason and the Ahmadi believes was only due to the blessings of financial sacrifices. Ameer of London writes that a friend told him that he prayed a lot for help in payment of his Tehrik e Jadid chanda. God put in his heart that rather than take the train he should travel by bus. Although this way his journey took 30 minutes more but he could save £2 every day. He saved £400 in a year which he gave for Tehrik e Jadid. An Ahmadi’s home in London was robbed but his Tehrik e Jadid contribution of £1000 was not taken. He gave the money as he had intended. It is important to safeguard against thieves. These days the police is alerting about this, especially asking Asians not to keep jewellery at home. However, some people are a little too cautious and lock doors and windows and then hide the keys. So much so that sometimes the family has problems leaving the house. While it is important to be cautious it should be within reason. Missionary-in-charge Australia writes that at a recent Ijtema the Atfal were given vouchers as prizes. Attention was also drawn to Tehrik e Jadid at the Ijtema. Three Atfal who are noteworthy, namely, Arsalan, Atif and Kamran were given vouchers worth $89 each as prizes. All three added $11 from their own pockets and gave $100 each as Tehrik e Jadid contribution. These were just a few accounts from numerous accounts of financial sacrifice. These sacrifices are not only made by long-term Ahmadis, but the new-comers are also making amazing sacrifices. One Murrabi Sahib wrote that some people complain that with the obligatory chanda in place, what is the need to pay Tehrik e Jadid and Waqfe Jadid! The answer to this was within the letter of the Murrabi Sahib who went on to say that the complaint was made by someone who did not attend Jama’at programmes very much and also was not a regular chanda payer. The obligatory chanda is certainly the first choice for all earning members. However, one may pay according to one’s means for Tehrik e Jadid, Waqfe Jadid and other schemes. These schemes are to instil the practice of giving in new comers, children and non-earning members. Let it be clear that the task of dissemination of faith is increasing and widening and for this attention should be given to financial sacrifice. The odd objector tries and poison minds of others. For the information of Jama’at with the grace of God, currently MTA broadcasts all over the world via ten satellites. The cost of these satellites alone, quite apart from all the other MTA expenses, is so high that when it is mentioned to others that MTA operates on financial giving and without advertisement revenue they are astonished. Although some Jama’ats contribute towards the running of MTA as do some individuals, the proceeds are insignificant compared to the costs which are met by other means. MTA is also building studios in different countries. The cost of all the mosques, schools and hospitals built this year on central and not local level, is almost the same as the total contributions of Tehrik e Jadid for last year. This is a general outline of costs etc. The Jama’at spends on massive scale and tries and saves money. Further efforts should be made to save money so that with maximum saving God’s work is further extended. God Himself puts it in the hearts of true believers to give more for He knows what the needs and requirements of faith are. He enables us to partake in good causes. The new year of Tehrik e Jadid commenced on 1 November 2014 with last year closing on 31 October 2014. This was the eightieth year of the scheme and the worldwide contributions stand at £8,470,800.00. This was an increase of more than £600,000 from the year before. In spite of the adverse state of affairs there, Pakistan still took the most contributions. Pakistani Ahmadis are at the forefront of financial giving and also in sacrificing their lives. May God soon make things easy for them and grant them tranquillity and may the situation there open avenues of Tabligh for the Jama’at. The positions of Jama’ats outside Pakistan are as follows: Germany, UK, USA, Canada, India, Australia, Indonesia, two Middle Eastern countries, Switzerland, Ghana and Nigeria. In terms of increasing their contribution Ghana came first with 50% increase in their local currency. Australia was second with 44% increase, followed by Middles Eastern countries increasing by 17%. Switzerland increased by 15% Pakistan by 14% and the UK by 13%. The rest of the countries in this category are: Indonesia, India, Germany and Canada. In terms of per capita contribution USA stood first, followed by Switzerland and Australia. Attention was drawn for the past few years to increase number of contributors rather than contribution which would grow of its own accord. With the grace of God last year the number of people participating in Tehrik e Jadid was 1,211,700. In the last four years approximately 600,000 more people have joined Tehrik e Jadid. In Africa the following countries made the largest contributions. Ghana was first, followed by Nigeria, Mauritius, Burkina Faso, Tanzania, Benin, Gambia, Kenya, Sierra Leone and Uganda. Dafter Awal has 5, 927 registers, of whom 105 are of living contributors and the remaining are maintained by families on behalf of their deceased relatives. The first three cities in Pakistan were: Lahore, Rabwah and Karachi. Whereas the following districts were at the forefront: Sialkot, Faisalabad, Sargodha, Gujranwala, Umerkot, Gujrat, Badin, Narowal, Toba Tek Singh, Kasur and Nankana Sahib. The first ten Jama’ats of the UK were: Fazl Mosque, Worcester Park, New Malden, West Hill, Mosque West, Birmingham Central, Cheam, Raynes Park, Gillingham and Baitul Futuh. Among the smaller Jama’ats the first few were: Leamington Spa, Bournemouth, Wolverhampton, Spen Valley and Coventry. The first five regions of the UK were: London, Midlands, North East, South and Middlesex. The first Jama’ats of USA were: Silicon Valley, Los Angeles East, Detroit, Seattle and Harriburg. In Canada the first five Jama’ats were: Calgary, Peace Village, Vaughan and Vancouver. Their first few regions were: Edmonton, Ottawa, Durham, Saskatoon South, Milton George Town and Lloydminster. The first ten Jama’ats in India were: Kerala, Calicut, Hyderabad, Qadian, Kananor Town, Bengadi, Sulur, Kolkata, Chennai and Bangalore. The first ten Jama’ats of Australia were: Blacktown, Melbourne, Adelaide, Marsden Park, Canberra, Mount Druitt, Brisbane, Tasmania, Perth and Darwin. May God accept the financial sacrifice made by all and bless them and may He enable the administration of the Jama’at to spend properly! A funeral Prayer in absentia was announced. Ghanaian mu’allim and missionary Alhaj Yusuf Edusei Sahib passed away in Kumasi, Ghana on 2 November 2014. On the morning of 2 November he had travelled four to five hundred kilo metres to oversee the construction of a regional mosque. He was to spend the night in Tamale but he insisted on returning home to Kumasi. Upon reach the city he felt unwell and lay down in the veranda of his house. His family promptly took him to hospital. As soon as the doctor started his medical investigation, Yusuf Sahib passed away. The doctor said although he did not know Yusuf Sahib seeing the way he passed away he could tell that he was a great man. Yusuf Sahib was born to a Christian family and was greatly drawn to religion from childhood. One day while staying with his uncle and still a student he thought what he would gain if he were to garner all the glitz of the world but God was not happy with him. His uncle was in the cinema business and although he had grown accustomed to watching films, Yusuf Sahib felt disgust towards it and left. He went to a Catholic church and prayed, O God, if my life displeases You, cause me to die when You are pleased with me. This prayer of his was accepted instantly. As he came out of the church he met a friend who told him that he had heard the teachings of a faith which he had liked and he was going to their mission house and asked if he wanted to come along. Yusuf Sahib agreed and they both came to Kumasi mission house. They met the Ahmadi missionary there who read out conditions of Bai’at to both of them, without asking who had come for Bai’at. It was only after reading out the conditions of Bai’at that the missionary asked which one of them had come for Bai’at. Yusuf Edusei Sahib said they both wanted to take Bai’at and thus he entered Ahmadiyyat at the age of 16. He faced a lot of hostility from his parents, especially his father, but stayed firm on his faith. Later, he did Tabligh to his father and he also accepted Ahmadiyyat. At the age of 20 Yusuf Sahib completed his education at the Jamia, Ghana. He got married and continued to traverse spiritual stages. Yusuf Sahib fell very ill at the age of 40 and the doctors suggested amputating his leg. Some of the doctors told him there was no cure for his illness and he would not live for long. If the doctors did not pay attention to him, he would himself administer pain relief injection and say to his leg: O leg of mine, I am a man of God and a servant of the Promised Messiah. I have to go to different places to do Tabligh and you cannot become a hindrance in this. 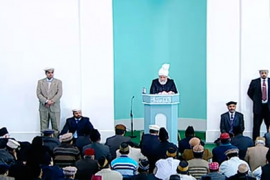 Hazrat Khalifatul Masih V had personally observed the zeal and fervour of his Tabligh. Hazrat Khalifatul Masih IV (may Allah have mercy on him) sent Yusuf Sahib to USA for treatment and wrote to the doctor who was to treat him that he was fortunate to take part in Yusuf’s treatment. He said do not consider that Yusuf has come to you, consider that I have come to you, because Yusuf is very dear to me. Look after him like you would look after me. Four operations were suggested and after the third, Yusuf Sahib refused to undergo another operation. The doctor wrote to Hazrat Khalifatul Masih IV (may Allah have mercy on him) informing him. Yusuf Sahib had also written to Hazrat Khalifatul Masih IV (may Allah have mercy on him) and mentioned a dream he had seen and based on this he said if he did not wish to undergo the fourth operation it was fine but he would be healed. And God indeed granted him healing. Yusuf Sahib experienced a vision in his room. He saw the Quranic verse ‘As for those who say, ‘Our Lord is Allah,’ and remain steadfast…’(41:31) written on a wall of his room and also heard its recitation. After the recitation finished a strange man came and sat next to him and stroked his leg with his hand and said ‘do not worry, Yusuf, your illness will go away and soon you will be healed.’ He had been suffering with the illness for nine years but miraculously until his end no sign of the illness remained. Missionary Kausar Sahib says that he showed his leg to him in 2005 in Qadian and it was in good health. It was indicated to Yusuf Sahib that he would pass away that the age of 63. When he was about to turn 63 he gathered his children and read the Quranic verse: ‘Were you present when death came to Jacob, when he said to his sons, ‘What will you worship after me?’…’(2:134)He said to his children, ‘I ask you as Jacob asked his offspring who will you worship? His children replied they would worship Allah the Exalted. He told them that his life was before them. He had spent his entire life for the Jama’at. He said now that the time of his death was near his true heir would be the one who was most righteous. A few days later he told his brother that in reality on the day he turned 63 the angel of death had appeared but Yusuf Sahib had asked for some respite and the angel had agreed to give some respite. Although the angel had not said anything specific but Yusuf Sahib felt the respite was to last around the age of 70. When Maulana Wahab Adam passed away earlier this year, Yusuf Sahib used to say his time was imminent. Sincere Ghanaian individuals are departing, may God grant greater sincere individuals to the Jama’at. He had come to the Jalsa here in the UK this year. He was a little unwell and Hazrat Khalifatul Masih V had referred him to some doctors but he wished to quickly return home. The doctors agreed that the treatment could continue to be carried out in Ghana. Once during his Jalsa address Hazrat Khalifatul Masih IV (may Allah have mercy on him) had asked him to join on stage and placing his hand on Yusuf Sahib’s shoulder he said: ‘Yusuf I know you do not like your good works to be mentioned before people, however, your good works have manifested themselves and I wish to tell the Jama’at that you are a very pious and righteous person.’ Yusuf Sahib heard all this with tear-filled eyes. During the 2004 tour of Hazrat Khalifatul Masih V he noticed how Yusuf Sahib was at the forefront of financial sacrifice. Hazrat Khalifatul Masih V said as far as he remembered Yusuf Sahib had developed a medicine which was widely marketed and garnered a lot of profit. Yusuf Sahib used the proceeds to build around 40 to 45 mosques in Ghana, some of them very good and large mosques. He also had a Tabligh centre built which he showed to Huzoor who told him that he should also allow others to be of service to which Yusuf Sahib most humbly replied that as God enabled him he would continue with his efforts. He was a very simple, munificent, generous and righteous person. He experienced visions and observed Tahajjud Prayers. He was a gentle person of high morals who had great love for Khilafat. He was very careful not to waste food at home. He once saw wastage of food at home and cried during Salat. When he was asked the reason for crying he said God grants us provisions and we waste it, how will we answer God! One son of Yusuf Sahib, Hafiz Ishamil Edusei is a student of the seven-year Shahid course at International Jamia. He says when he returned home after completing his hifz (memorisation) of Qur’an his father gave him extraordinary respect. Once he did something which displeased his father, so he said: ‘I cannot tell you off out of respect of the Qur’an that you have memorised but you too should try and not do such things out of respect of the Qur’an.’ His son says had his father told him off its effect would not have been as deep as the impact of what he said. He says his parents brought him up as a would-be missionary. When he asked them for money they would give him little money explaining that he was to become a missionary and every missionary should suffice on little money and shun extravagance. He says his father drew attention to many fine points. One day he was doing wudu (ablution) with his father and his father finished first and told his son that he was to become a missionary and missionaries have great responsibilities and very little time. Therefore he should learn to do as much work as possible in as little time as possible. Yusuf Sahib was a role model for missionaries. He did a lot of Tabligh with great zeal and fervour – he was a very simple person. God granted him a lot and he spent it on the Jama’at in building mosques. His last journey was also for the construction of a mosque. He was enabled to translate the Holy Qur’an in a regional Ghanaian language. Wahab Adam Sahib’s son writes that Yusuf Sahib was at the absolute forefront of financial giving. He was an extraordinary individual who had an extraordinary empathy for the mission and had zeal and eagerness to serve. He leaves behind his widow, three sons and five daughters. With the grace of God all of them have a strong connection of sincerity and loyalty with Khilafat and the Jama’at. One daughter, Fatiha Sahiba is the head teacher of the International Taleemul Islam School in Accra and as mentioned earlier the youngest son is a third year student at International Jamia. May God elevate the station of the deceased and continue to increase his children in sincerity!